The Forward Together Moral Movement, which has been called “the new Civil Rights Movement,” seeks equal treatment and opportunity for all, regardless of economic status, sexual orientation, gender identity, belief, race, geography, and any other basis of discrimination. 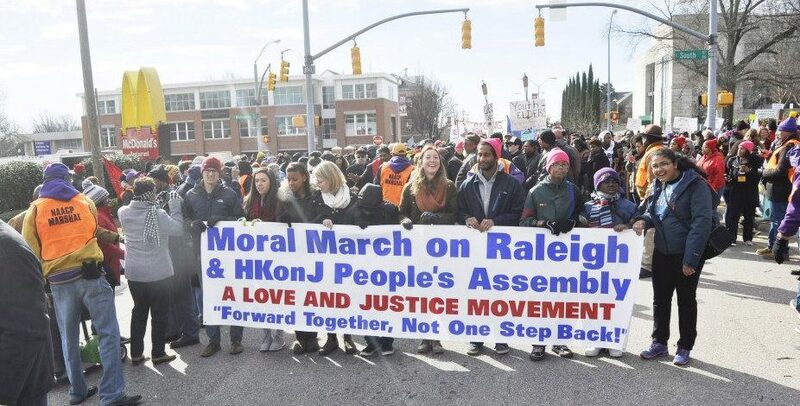 The Forward Together Moral Movement has grown into a potent progressive force in North Carolina and across the country, with indigenous leadership nationwide using its lessons to inform their own grassroots campaigns to fight injustice and oppression that their communities face. Forward Justice supports these efforts with strategic legal representation, policy expertise, and assistance with strategic communications, organizing, and coalition and base building to advance its transformative vision. Starting in 2017, Forward Justice will provide policy and strategy technical assistance for the newly emerging Poor People’s Campaign, in partnership with Repairers of the Breach. We support their work to engage and train local community groups across the country, sharing tested models of grassroots, faith-based mobilization to advance a progressive social justice agenda, grounded in a moral vision. In the summer and fall of 2016, Forward justice represented the North Carolina State Conference of the NAACP in its historic win against racially discriminatory disenfranchisement before the U.S. Court of Appeals for the Fourth Circuit in NC NAACP v. McCrory and the U.S. Supreme Court. Finding that the North Carolina General Assembly “target[ed] African Americans with almost surgical precision” and “impos[ed] cures for problems that did not exist,” the Court struck down North Carolina’s racially discriminatory voter ID and reinstated critical avenues for ballot access including: same-day registration during early voting, the safeguard of out-of-precinct voting on election day, pre-registration option for 16 and 17 year olds, and an additional full week of early voting opportunities. The Fourth Circuit’s decision sent a decisive message nationally, signaling a change in tide in the courts and in public opinion, affirmed by the US Supreme Court. On the heels of that victory, our legal team successfully brought additional novel federal litigation, NC NAACP v. NC State Board of Elections, opposing what had been a long-standing, previously unchallenged state practice of permitting individual mail-based challenges that appeared to target African-American voters, in violation of the National Voter Registration Act (NVRA). As a result of this suit, we succeeded in securing an emergency injunction on the eve of the 2016 election, blocking further illegal purging, reinstating thousands of voters to the rolls, and publicizing the stories of those directly impacted. Alongside this strategic litigation, Forward Justice operated as a legal, communications, and policy wing for the Movement’s issue-based, nonpartisan Our Time, Our Vote! Campaign. We provided rapid response voter protection support not just on Election day, but throughout North Carolina’s early voting period, a period that has traditionally gone without holistic election protection coverage. In concert with longstanding highly effective allied organizations on the state, our team enabled NC NAACP to fill gaps in real-time early voting complain tracking and response. Our advocacy and legal support continued post-election to defend against unfounded propaganda, protests, and other intimidation tactics that spread misplaced public fear of voter fraud and hostility towards voters of color. Following the NC NAACP’s legal victories, North Carolina has one of the most accessible democratic processes in the South, with strong policies and practices in place and held accountable by this powerful and engaged Movement. This work to advance participatory democracy, lift up stories of directly impacted and disenfranchised people is rooted in the vision and needs of our movement partners, under the leadership of Rev. 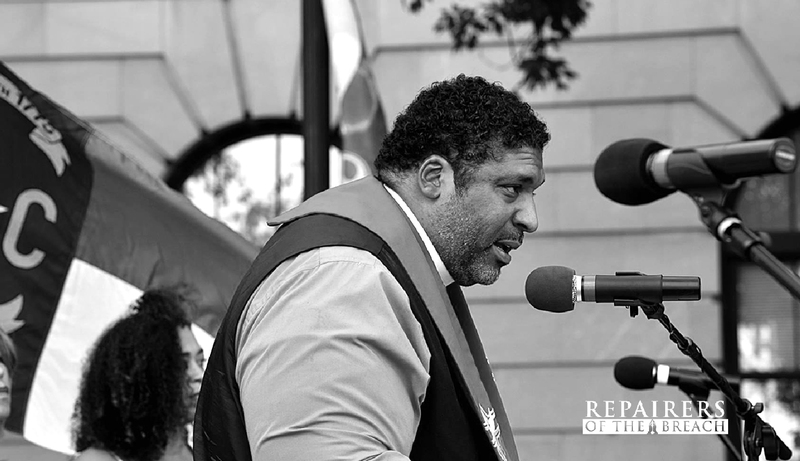 Dr. William Barber II. Together, we have built power and capacity to fight back against destructive, regressive climate in North Carolina, defining the narrative and winning tangible victories. Immoral public policies are destroying communities across the South and we will respond to calls for support as needed. With lessons learned from this work in North Carolina, Forward Justice will expand our support for of moral leaders and activists in other states. We are poised to leverage this learning to further Southern movement-building as well as continue to support civic engagement in North Carolina.